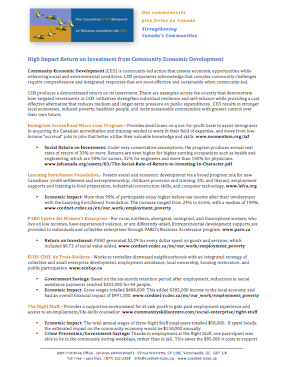 Community Economic Development (CED) produces a demonstrated return on its investment. There are examples across the country that demonstrate how targeted investments in CED initiatives strengthen individual resilience and self-reliance while providing a cost effective alternative that reduces medium and longer-term pressure on public expenditures. The following resources offer some models for return on investment (ROI), social return on investment (SROI), cost-benefit calculations and evaluation resources for CED efforts, social enterprises and related initiatives. Please share our two-page overview, of some of the key demonstrated results generated by CED initiatives from across the country. This resource can be shared with policy-makers, funders, and the general public to help spread the word about the impact our work is having in communities across the country. Section 2, Participant Learning. Report by the Toronto Enterprise Fund, 2004. Report 10 of this document quantifies the impacts of participation in social-purpose enterprises by homeless and at-risk-of-homelessness populations according to the five asset areas of the sustainable livelihoods model. This six-page overview profiles the impacts of CVE's training businesses providing employment and training to individuals with psychiatric disabilities. It includes calculations of enterprise value, social purpose value and blended value, with indices of return for each. This is one of ten profiles and background information available at the link above. Based in Cardiff, Pack-IT is a Social Firm that provides mailing, storage and distribution, and on-line fulfilment services to a variety of customers. Approximately half of the company’s employees have a learning disability. The aggregate social value created by Pack-IT each year is projected to be £71,600, which translates into value added of £33,700 after adjusting for the value of the grant and wage subsidies. Pack-IT’s SROI ratio of 1.9:1 implies that, for every £1 invested, £1.90 of social value is created each year for society in terms of reduced welfare costs and increased local purchasing. However, there are a number of other benefits, such as increased self-confidence and independence of the disabled employees, suggesting that the social return calculations likely underestimate the true social value created by Pack-IT. Ontario Association of Food Banks, November 2008. Produced with support from Don Drummond, Judith Maxwell, James Milway, Mark Stabile and John Stapleton, this report provides valuable benchmarks and models for calculating the economic costs and impacts of poverty. Ministry of Economic Development, Innovation and Export in Québec, 2008 edition, translated by the Ontario Co-operative Association. This is some of the original data showing the significantly greater survival rate of co-ops compared to traditional businesses. The five-year survival rate of co-ops is 62%, compared to 35% for other forms of businesses, and 44% after 10 years compared to 20% for other forms of business. Canadian Centre for Policy Alternatives Manitoba Office, June 2009. This report includes a number of calculations of the economic benefits of strategic poverty reduction investments. For example, a commitment to build 300 new social housing units per year (at a cost of approximately $150,000-200,000 per unit) in Manitoba would cost $45-60 million annually but would result in 1,800 jobs and an additional $90-million in GDP each year (p.26). This report looks at the evolution of REDF's Social Return on Investment (SROI) approaches and identifies priority areas for further development in the field. It costs between $7.1 billion-$9.5 billion every year to perpetuate poverty in Alberta. With a strategy in place, Alberta could lift 148,000 families and 73,000 children out of poverty. This report offers solutions and analyzes how effective our strategies have been thus far. The conclusions are clear: investing in poverty prevention would be much less costly in the long run than spending to alleviate poverty in perpetuity. A compelling cost-benefit approach to poverty reduction provides economic evidence to help inform the creation of policy. Ultimately, this report aims to contribute to an effective, meaningful, and sustainable Poverty Reduction Strategy in Alberta. This document reports on a review of 48 major comprehensive community initiatives in the United States over the previous 20 years, identifies accomplishments, and suggests conclusions about the importance of alignment of mission, action, capacity, collaboration and learning for success. This report is an analysis of the results of the Women's Economic Development Collaborative Fund, a five-year, $4.8 million program that provided financial and technical support to ten community programs across Canada that helped 1,682 low-income women and sought to help them transition out of poverty and build a sustainable livelihood. The report found strong gains among participants in all five asset areas of the sustainable livelihoods framework, and based on the reductions to social assistance, found a return of $1.3 million on an investment of $659,030 (p.29). The SROI UK Network, now "The Social Value UK" promotes the use and development of the Social Return on Investment methodology internationally, encouraging a community of practice along the way. The The Social Value UK is a membership organisation and a company limited by guarantee. SROI-Canada is a new network building a broad-based understanding of how social value is created and provides opportunities for every level of practitioner to build their own skill in relation to SROI. SROI Canada offers training and accreditation programs, and their website serves as a hub of methodology and the only financial proxy database offering standardized measurement across Canada. Cabinet Office, Office of the Third Sector, Government of the United Kingdom, 2009. This guide provides an introduction to social return on investment (SROI), a guide to SROI analysis, and further resources. An Economic Evaluation of Alberta's Immigrant Access Fund Micro-Loan Program, J.C. Herbert Emery and Ana Ferrer, Department of Economics, University of Calgary, 2010. The IAF provides small loans on a not-for-profit basis to assist immigrants in acquiring the Canadian accreditation and training they need to work in their field of expertise. These loans assist skilled immigrants in moving from low income “survival” jobs to jobs that better utilize their valuable knowledge and skills. This study finds that under very conservative assumptions, the program produces annual real rates of return of 33% or more. Returns are even higher for higher earning occupations such as health and engineering, which are 58% for nurses, 32% for engineers and more than 100% for physicians. Ekos Research Associates, September 2010. This report examines the Government of Manitoba's Neighbourhoods Alive! program and its community-led neighbourhood revitalization model which seeks to improve community stability, capacity building, well-being and economic development. The evaluation findings support the continued relevance and need for Neighbourhoods Alive! (NA!). While there have been improvements in communities in many areas, the original neighbourhoods included in the NA! program continue to experience issues related to safety, economic hardship and lack of affordable housing. The overall NA! program model and mix of interventions are appropriate, and the capacity of neighbourhood renewal corporations is improving with many projects occurring. The Alternative Federal Budget 2011, Canadian Centre for Policy Alternatives. The 2011 Alternative Federal Budget contains numerous return on investment calculations for various program options, such as early childhood education and care. Every dollar invested in child care programs increases GDP by $2.30 - one of the strongest levels of short-term economic stimulus of all sectors and far ahead of construction and manufacturing. Over the long term, every dollar invested in quality child care programs returns $2.54 in benefits to society. Even in the short term, more than 90% of the cost of hiring child care workers goes back to governments as increased revenue, and the federal government gains the most. Investing $1 million in the child care sector generates almost 40 jobs - at least 40% higher than the next closest industry, and four times the jobs generated by investing $1 million in construction activity (p.43). Alberta Community and Co-operative Association and BC-Alberta Social Economy Research Alliance, 2011. This study found that 92.1% of co-ops incorporated between 2000 and 2004 were still operating after five years, 84.6% of co-ops incorporated in 2005 were still operating after three years, and 78.6% of co-ops incorporated in 2006 were still operating after three years. In comparison, the study found that other businesses incorporated in Alberta between 2005 and 2008 had a three-year survival rate of 48%. British Columbia Co-operative Association and BC-Alberta Social Economy Research Alliance, 2011. This study confirms similar research in other provinces, that overall, the survival rate of co-operatives in BC is significantly higher than that of conventional, capitalist forms of business. The 5-year survival rate of both operating and dissolved co-ops is 100 out of 150 co-ops for which data was available (or 66.6%). This compares favourably to the 2008 Québec study of survival rates of co-ops in that province of 64%. By contrast, Industry Canada figures show a 43% and 39% 5-year survival rate for conventional business start-ups in 1984 and 1993 respectively. In BC, business start-ups in 1984 experienced a 38% 5-year survival rate. Timothy Bartik, W.E. Upjohn Institute for Employment Research, 2011. This presentation reviews the evidence supporting an economic analysis of development strategies through business tax reductions and incentives versus local labour market measures to stimulate both labour demand and labour supply. Each $1 reduction in state and local business taxes increases the present value of per capita earnings of state residents by only 51 cents. An exemplary business tax incentive program might provide benefits, for each dollar invested, of increasing the present value of local per capita earnings by $3. Well-run customized job training and manufacturing extension services in crease the present value of local per capita earnings by at least $30 per dollar invested. Minnesota's MEED program, providing targeted wage subsidies, increased local earnings per capita by $6 for every $1 invested -- less than the 30 to 1 benefit cost ratio for manufacturing extension or customized job training, but targeting a larger proportion of the increased earnings per capita on lower income local residents. For each dollar invested in high-quality early childhood programs, the present value of lcoal per capita earnings increases by $2 or $3. These programs pay off purely in economic development terms, without even considering such social benefits as lowering the crime rate. This project gathered ideas from leading experts in the US to develop job creation proposals that met the following criteria: designed for implementation by cities and/or states and will lead to net new job creation in the short-term; practical, sustainable, scalable and already tested; and all jobs created should be accessible for low-skilled workers and offer some career opportunity. Based on this research, they present a wide range of costs from — $1,000 to $230,000 per job — for the creation of a variety of jobs, from part-time self-employment through full-year, full-time high quality jobs. Together, these proposals can create millions of new jobs. The Vibrant Communities (2002 - 2010) Evaluation Report contains the findings of a nine-year experiment that demonstrates the positive impacts of an innovative and collaborative approach to fighting poverty that is driving individual benefits, neighborhood changes and large scale community poverty reductions. For decision-makers, these findings show that a mounting body of evidence demonstrates the potential economic returns (based on both direct and indirect evidence of ROI) of effective interventions; this will allow them to make the business case and take on perhaps a more strategic approach in investing in targeted mental health promotion and prevention strategies. The study of Québec's 47 training businesses found that governments recoup two-thirds of their outlay in the first year and completely recover their investment in just 29 months. Furthermore, the training businesses generate important medium-term economic benefits, while managing to train and team up with persons on a very long journey to the labour market. The $36.3 million investment made in 2008 will enable governments to reap total economic gains of almost $100 million in 21 years, and thus realize a surplus of nearly $60 million. The Demonstrating Value Project is a collaborative research project to develop a framework for assessing the impact and performance of social enterprises in Canada. The project engages both social enterprise investors and operators in a process to develop and pilot a framework that will assist a social enterprise and their stakeholders to understand, communicate and assess financial performance, organizational sustainability, and mission-related impacts. The poverty gap in Canada in 2007 -- the money it would have taken to bring everyone just over the poverty line -- was $12.3 billion. The total cost of poverty that year was double or more using the most cautious estimates. A long-term, investment approach is more appropriate to human well-being and development than a short-term, spending approach focused largely on costs. We could achieve better human and financial outcomes by contributing to greater productivity and wellbeing. The results will show up in lower poverty rates, reduced strain on health care and other public service systems, and less stress, anxiety and debt in our lives. The Alternative Federal Budget recognizes and proposes preliminary solutions to climate change and rampant inequality. The AFB addresses the underlying structural weaknesses in our economy and recommends building blocks that will repair and ensure the long-term prosperity of our economy. Lastly, the AFB proposes innovative public investment initiatives that will help us avoid "a lost decade of high unemployment, depressed incomes, and chronic insecurity. Many of these proposals include CED principles, and CCEDNet is a proud contributor to the AFB report. This study found a cumulative social return on investment for Inner City Renovations between 2002 and 2008 of 55%, with total cost savings to society of $665,000. This paper reviews the social impact measurement landscape and highlights some notable approaches to measuring impact. This article reviews the landscape of approaches to measuring social value and impacts, and makes the case that we shouldn't assume that social value is objective, fixed, and stable. When we approach social value as subjective, malleable, and variable, we create better metrics to capture it. This report profiles four effective practices of CED approaches to poverty reduction and outlines the ways they measure their impacts, including the sustainable livelihoods model, the expanded value added statement, increases in local economic activity and local multiplier effects, increases in participant income and savings to governments (through reduced social assistance, justice and health costs). This is a handy, 4-page overview of the SROI, outlining the value of SROI, some models, and selected resources for more information. Another handy, 4-page presentation of social accounting, the expanded value-added statement, accounting for volunteer hours, calculating return on investment and accounting for social impact. This study documents the Aboriginal Financial Institution (AFI) cost of $13,079 per job created and maintained, through the provision of loans and support services to Aboriginal small and medium size enterprises. Compared to other Government job creation program costs which average $36,193 (table 6 of the document), job creation through AFIs reflects a markedly superior value. There are 55 AFIs actively engaged in the provision of development loans and support services to Aboriginal SMEs in all parts of Canada. Founded in 2009, the Investing in Impact Partnership is made up of the Centre for Social Impact (CSI); PricewaterhouseCoopers (PwC) Foundation; and Social Ventures Australia (SVA). the main objectives of the Partnership were to increase the understanding of SRoI as an impact measurement approach, improve the evidence base of impact for employment creating social enterprises, and improve the transparency of non-profit organisations reporting on their impact. Since the commencement of the Partnership in 2009, several developments have occurred: interest in understanding SRoI has grown to include a database of over 800 individuals receiving the SRoI newsletter; there are discussions around establishing an Australian SRoI network; one or two day training courses have been delivered to about 390 people; 49 SRoI analyses have been conducted by SVA; a national conference has been held (october 2011); and, contributions to dialogue at the global level about the further refinement of SRoI policy and practice have been made. This report assesses the impact of these developments and advises on actions the Partnership can take to further the development and take-up of SRoI in Australia. This Guide is an update to the 2009 Guide to Social Return on Investment that was published by the Cabinet Office (UK). It provides a guide to social return on investment analysis and additional resources. Indicateurs de rentabilité sociale ou indicateurs d'impact économique? Comment définir et construire des indicateurs de rentabilité sociale ou d'impact économique? Ce guide examine les approches pour mesurer les impacts sociaux et économiques en économie sociale et en action communautaire. The purpose of this framework is to collect and explain different options for calculating monetized SROI, ensure that organization at different states of capacity and development and across many sectors can conduct SROI analysis, ensure that SROI analysis are presented in a way that facilitates accurate interpretation of results and comparing approaches and impacts, and lay the groundwork for standardization. Impact Reporting & Investment Standards (IRIS) is a common language for describing the social and environmental performance of an organization. Directed at investors, companies raising capital, and member-based organizations looking for a shared reporting framework, IRIS provides an independent set of metrics for organizations to use when reporting their impact. IRIS indicators include specialized metrics for a range of sectors including financial services, agriculture, and energy. Like financial accounting standards, IRIS provides a basis for performance reporting and organizations need only report on applicable metrics from the IRIS library. SVT Group is an impact accounting firm providing advisory services, education, and R&D for values driven organizations. Located in San Francisco, SVT specializes in enabling clients to understand what social and environmental impacts they are having, how to increase the impact per dollar, and how to communicate impact for strategic advantage. Analogous to financial accounting firms, impact accounting firms measure environmental and social impact and value creation, design and implement management systems to track social or environmental performance indicators, audit the integrity of impact and sustainability reports, and provide strategic advice associated with impact. SiMPACT Strategy Group aims to increase the effectiveness, value and impact of investments in community and across society. They are a leading Canadian and international expert in the social return on investment (SROI) methodology, which includes analysis, advisory and training. SiMPACT is represented on the Methdology Committee of The SROI Network international and are a founding Network Partner of SROI Canada. Their focus areas are SROI training, custom SROI analysis, and community investment management. Women’s Venture, a self-employment training program, decreases the likelihood participants will need government assistance, subsidized health care and other support services in the future while increasing the likelihood they will open new businesses, earn a higher income, pay taxes, employ others and contribute to the local economy. This five-year SROI analysis found that for every $1 invested in the program, over $3 in value is created in the community. After two years, the social returns of the Women’s Venture Program started to exceed the initial investment by funders. Regroupant des organismes communautaires œuvrant dans divers champs d’activités, la Corporation de développement communautaire de L’Érable (CDCÉ) a pour mission d’assurer la participation active du mouvement communautaire au développement socio-économique de son milieu et de travailler à l’amélioration de la qualité de vie des citoyennes et citoyens de la communauté locale. Ce dépliant trace un portrait de l'impact collectif du CDCÉ et du milieu communautaire du Centre-du-Québec. This report presents Operation Come Home's Reunite Program, which allowed 72 young people from across the country to go home in 2010. It estimates cost savings of $1.6 and $3m for the $53,000 invested in the Reunite Program. Social Impact Scotland is a portal offering access to information, resources and support for third sector organisations, funders, and public sector commissioners interested in finding out more about social impact measurement. A Canadian company with expertise in collaborative learning and evaluation, and community economic development, Eko Nomos promotes innovation and effectiveness in social, environmental and economic development programs. This evaluation of RDÉE Canada's activities between 2002-2007 found that each permanent provincial and territorial RDÉE employee generates 24.25 indirect jobs that would not have been created without his or her involvement. They also work with 45 volunteers and 104 partners, and improve accessibility to quality French community economic development services and greater CED capacity. Cette évaluation des activités du RDÉE Canada entre 2002 et 2007 a conclu que chaque employé permanent des RDÉE provinciaux et territoriaux génère, en moyenne 24,25 emplois indirects qui n'auraient pas été créés sans leur implication. Ces personnes travaillent aussi avec 45 bénévoles et 104 partenaires, et améliorent l'accessibilité à des services de qualité en français en matière de développement économique communautaire et des compétences associées. This report evaluates the Rural Community Economic Development Program and Rural Diversification Initiative, delivered by the Community Futures Network of Alberta. Results indicate that the size of the community is a significant factor associated with success, with very rural regions and small communities (populations less than 2000 people) having more difficulty accessing economic development funding programs and being less likely to complete a project successfully due to lack of resources. The study also showed that having a CED Coordinator who was able to start and complete projects was helpful. The consensus of interview participants was that Project Officers were a resource of major importance for the projects. The CED Coordinators and RDI Project Officers assisted with idea generation, proposal writing, reporting, and providing ongoing support to projects. This paper presents the text of remarks delivered at the 2012 Social Finance Forum held at the MaRS Discovery District on November 8-9, 2012. Social Return on Investment is an evaluation methodology that seeks to move the assessment process from a focus on cost alone to one that includes value. It gives the social field the tools and language to get important issues heard at multisectoral tables where these concerns are often misunderstood, undervalued or dismissed as unimportant. Despite its vital contribution, there are serious philosophical, conceptual and methodological challenges embedded in this approach. These include the focus on quantification, the possibility of ‘creaming’ program participants most likely to succeed, the problem of attribution and the need to take into account key developments in the broader economic and social context. Poverty Costs 2.0: Investing in Albertans is a follow-up report to the work presented in Poverty Costs: An Economic Case for a Preventative Poverty Reduction Strategy in Alberta (2012). Indeed the final chapter of the first Poverty Costs report outlines in a broad way, the kinds of policy driven components a comprehensive strategy to reduce poverty in Alberta would require. Sherri Torjman, an eminent social policy expert, has identified 10 “poverty policy” areas where provincial/territorial governments can create or improve upon existing policies and legislation with a view to preventing and reducing poverty.